Discussion in 'CellPerformance@B3D' started by patsu, Jul 11, 2008. It's a long interview with Toshiba Corporation, Digital Media Network Company CEO (Yoshihide Fujii). The interview is rather interesting, covers their HDM war aftermath, SED and [Ta-dah !] Cell. I'll only translate the Cell questions. It looks like they are taking the Cell TV business very seriously. I see TV as a channel to enjoy multiple entertainment services (e.g., Internet content and messages). I believe processing (power) is the key to enable these services. I am a semi-conductor guy; while handling digital media businesses, I find that many CE executives are rather passive/pessimistic about effective use of a high performance CPU. Understand that in this era, semi-conductor will always fall in price, more and more powerful CE devices will be made. By effectively using high performance CPU, application, middleware, and firmware in a TV, we will be able to create applications that no one has done on a TV yet. Toshiba has teh Cell !!1!!!. At the same time, CE companies will avoid IT industry/market. But Toshiba has been in the IT (PC) industry for a long time, we can integrate CE into the Internet, introduce our culture and technologies. These are our advantages. Cell-equiped TVs will touch down in 2009. What we invested in are not merely TVs from the factories... but experiences and technologies in the digital era. We will protect the consumers' interests [i.e., make their purchase worthwhile], and throw in all our multi-disciplinary experiences. If it is only about receiving TV signals, then companies who have the brand and display technology hold the advantage. The advances in technologies, due to the proliferation of the Internet, has become more transparent. The general needs have advanced to the stage/domain where Toshiba's forte in advanced technologies are relevant. Toshiba has different/unique/diverse technologies, products and business models from other companies; these are the core values behind Toshiba's brand. We are ready for the battlefield, and are not worried about our TV business. 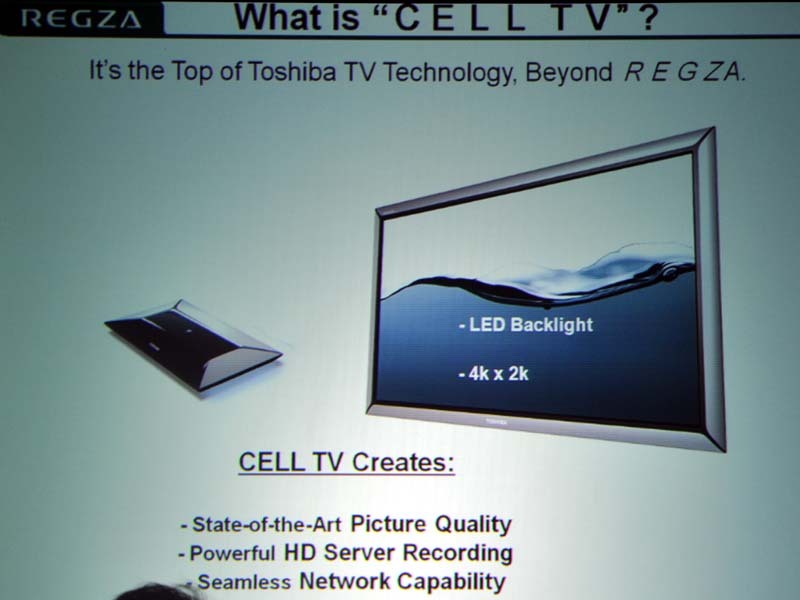 Toshiba will expand the TV business, with Cell TV as an important branch. Q. Toshiba CEO projected their 2010 profit to be 750 billion yen, MUCH more than 450 billion in 2007. Average growth is 16%. 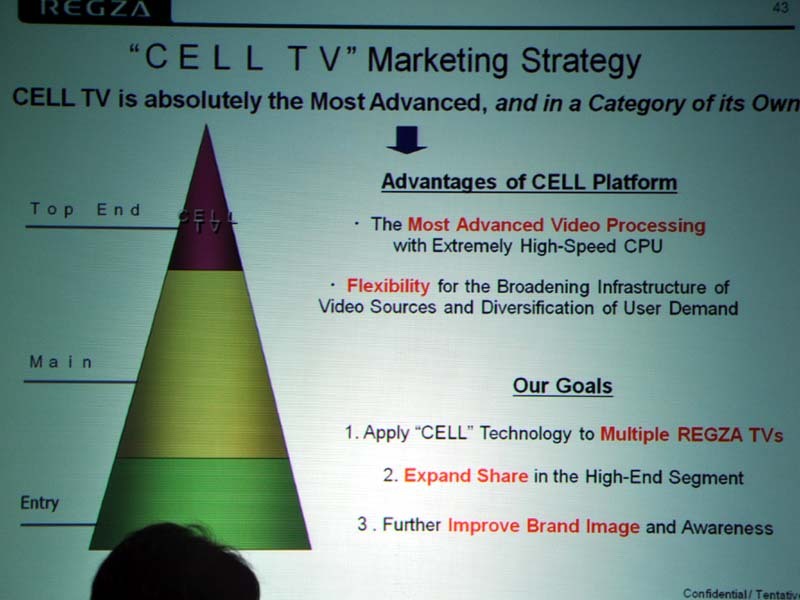 When Cell TV arrives in 2009, it won't contribute much to the business. Why such a high growth projection ? 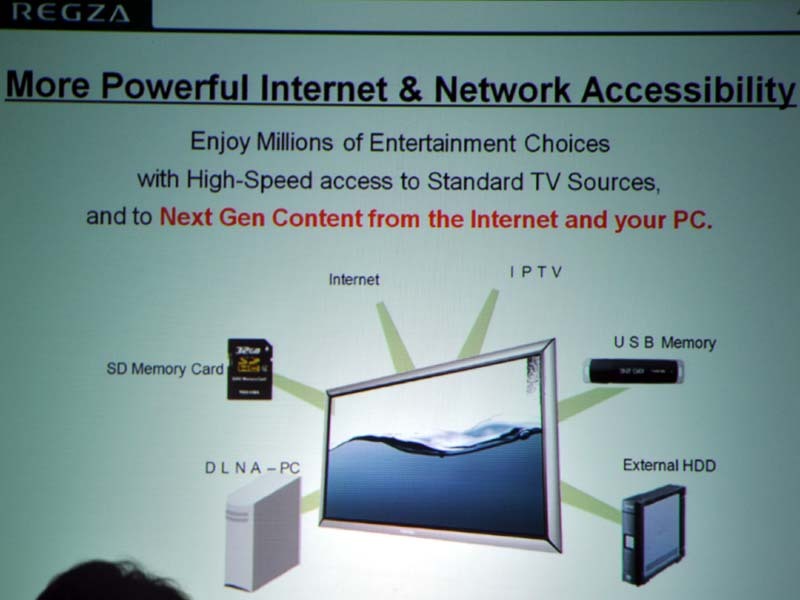 Toshiba CEO: The "convergent media" Cell TV is based on the foundation of the current TV business. It is Toshiba TV business's driver/catalyst. Over 90% of Cell TV's contribution in 2010 will be restricted by exporting products [Don't ask me why, I'm just translating]. For economy of scale reason, we want to reach the necessary scale. So we focus on the pricing strategy. The most important question is: "How best should we sell this regardless of the final Cell TV price" ? Toshiba understands the productization of PC technologies. We have developed, manufactured, designed -- using the best resources in the world. Many people think that ODM/OEM products stinks. This is a false impression. Taiwan's semi-conductor technologies are formidable, but how many of all the world's motherboards are made in Taiwan ? The same can be said of TV. It is sufficient to have superior technologies. We don't want to confuse our strategic intent with overseas technologies [I think the CEO may have meant "outsourced technologies" here. Essentially, Toshiba may be looking at OEM Cell TV also]. Even so, pricing is a critical point. Our brand should be the deciding factor here. Unfortunately, this is Toshiba's weakness. How do I raise this ? In 2-3 years, we will build a brand new Toshiba image. If we don't succeed, we will be in trouble. Then why do we based our future on a high growth index ? Previously, our losses are in the range of 300-400 billion yen. That means we will need a company size/scale of over 500 billion. If we don't scale ourselves to this level, our business model will be incomplete. Our target is to be a 750 billion company. Q. Considering business performance in the global hi-tech space, Toshiba did not make it to the top 7. It looks like you're tier two right now. We are at the beginning of the digital age. We have only touched superficially on display, HD DVD specs, Blu-ray specs, increasing HDD storage size, etc. All these do not determine the winner. Not being in the top 7 does not mean we are inferior. This is the beginning of the match. Like Toshiba hard disk, flash memory and PC, we have unique technologies. Toshiba has technologies that the digital era needs. Our biggest challenge is how to exploit these technologies. Until now, whether it's our semi-conductor business, or the Cell TV business, or the death of HD DVD, we have reflected within ourselves deeply. I see things from the semi-conductor business perspective. There are stuff that cannot be fitted to a TV or VCR yet. What I need is some ways to break away these barriers. This is my business view. But we are not solely chasing technologies. Toshiba's position is always consumer first. What consumers want, Toshiba will use our technologies, improve our efficiency, to enter the market. This is how we will win. How to value-add, how to learn from cases are key to being a winner. In this way, we are not just a company, but a reference for the entire industry. We learn together. When HD DVD ended, I felt this more strongly than before. Toshiba wants to be the top 8. We have hardware, technologies and resources not available to the other 7. Toshiba is enhancing its edges right now. How to complement DVD with HD DVD values, IPs, standards, team work. We also have healthy relationships with the industry in general. We head in the same direction as the top 7. Toshiba is confident that we will be the world's top electronics maker. The real winner will only be decided from now onwards. Please anticipate Toshiba. Toshiba will be introducing their line of Cell-enhanced TVs at IFA in August, so we'll see what the deal is at that time. Worth noting that Super Upconversion has been rebranded to "Upconversion+." Although they are saying 'Cell' in these quotes and releases, I am wondering whether it would actually be a full Cell or further extension of the SpursEngine. The 2009 launch date mentioned in the interview may be Asia-specific. As expected, Toshiba is offering a new (supposed) world's first here at IFA: a true upscaling TV, finally getting rid of the middle man for upconverting those SD sources. 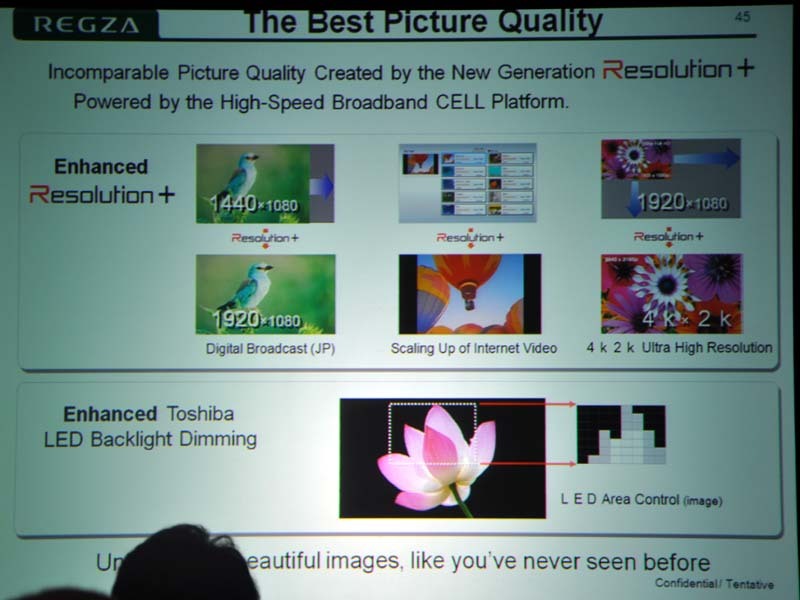 The new ZF Series LCDs include Cell processors and Toshiba's home grown Resolution+ technology, which does similar edge and detail enhancement to Toshiba's XDE upscaler -- sharpening detail, smoothing edges, and leaving the rest of the image alone -- but with the added fun of Cell power in the mix. As for the actual displays, Toshiba will be shipping the 40ZF575D (40-inch) and the 46ZF575D (46-inch), both offering 1080p, 30,000:1 dynamic contrast ratio, 6ms response times and Active Vision M100 HD 100Hz 5:5 pulldown processing, along with four HDMI plugs, component video, RGB and PC input. Right now this is just a Europe launch, and we don't have exact ship dates or pricing, but hopefully Toshiba will soon rectify that. 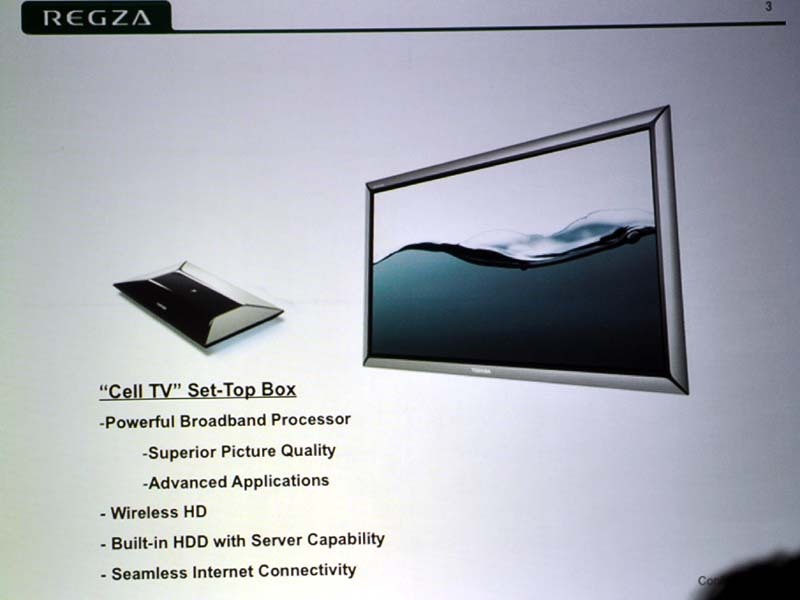 At CEATEC 2008 in Japan, Toshiba is demoing Cell TV that is to be released in 2009. The demo includes realtime upconversion and non-realtime video maturation (about which Kutaragi was talking in 2005) by their Resolution Plus technology, 3D GUI, 48-channel display, 8-channel fast switching, video search. The fast channel switching demo has a video in the article. Since channel switching in a digital TV set tends to be slower than in analogue TV, it's one of merits of using Cell easily noticeable by laymen. The last missing part is its price, basically Cell has been too hot & fast & pricey for a CE appliance. It's left to be seen how 45nm Cell can tackle these issues. They are also showing WinFast PxVC1100 by Leadtek and FIRECODER Blu by Canopus as SpursEngine-powered PCI-e cards. The retail price of WinFast PxVC1100 is around $300. It can do realtime MPEG-4 AVC encoding of HD movies. WinDVD can use SpursEngine to do Resolution Plus upconversion via SpursEngine middleware. The question will be just how fast (clock speed) will Cell BE need to run to work as advertised and basically the 45nm die shrink will take care of that by cutting thermals and power consumption so that it can have a passive heat sink solution included inside the HDTV because after all you don't expect to see a slot with a little fan. Another possibility is, finally the initial plan of using 7> working SPEs in these TVs becomes viable due to PS3 selling more each year... it cuts both cost and heat further. *Argh* Doesn't talk about Cell capabilities. We get closer and closer it seems... looks like at this CES Toshiba is going to be demoing a 55-inch Cell-based set. The high performance of the Cell platform bring superb picture quality and networking interactivity to TVs. Demonstrations at CES will include real-time super resolution imaging, using a 56-inch, 4k x 2k pixel panel to display images that the Cell platform upconverts from 1920x1080p to 3840x2160p, and also upconverting of content such as Internet video to high picture quality by application of “Resolution+” technology in combination with newly developed noise reduction technology. In addition, a 55-inch backlit LED panel controlled by the Cell platform will be showcased, and demonstrate high-speed control of all picture parameters, including an innovative local dimming function. Visitors can also see how the Cell TV goes beyond breathtaking image quality to deliver extremely fast and easy operation of networking functions. I don't understand why they have run TV adverts for a technology that's not out yet! Or do they mean something else regards their new upscaling range? The first ad was probably just for branding (to capture the holiday season). Toshiba mentioned that the Cell-based upscaling wasn't ready for release yet. They had another stop-gap measure in place. The launch date is set in Fall 2009. 60+-inch models have 4096*2160 panels. The home-server set-top box has Cell and 3TB HDD. It's connected to the LCD panel through Wireless HD. Thanks One. Literally, the Cell TV always seems about one year away, for two/three years now! But at least this time I have high confidence that we'll see it this Fall. Now so there's obviously this specific effort, and then they say they're targeting multiple Regza's as well; is the Cell platform resident on that STB always or are they talking about some sets with TV integration? Not that the majority of the value-add features aren't more suited to that STB situation anyway though. With a 4K res, I wonder what size panel they're targeting, and at what price they'll launch. Come on Toshiba, where *is* your Magic Mirror (Cell) application ? Come on Sony, where is your Magic Mirror rip-off ? Toshiba will (probably) have lower res models as well. So I guess this resolution will be for the Red camera then. It would be good if Toshiba open Cell TV to games developers. Bluray Player sales up 600% since Toshiba Dropped HDDVD.